Technology continues to evolve at a rapid rate and for business owners and marketers, this means keeping up with these changes and remaining prepared for others that may come. Audiences’ preferences as well also keep on changing. If you are a content marketer, you know very well how important it is to stay on top of things if your content is to have any kind of impact and one thing worth noting is that content marketing has been transitioning for years now. Now more than ever companies are using content to do more than just creating awareness or strengthening the brands. They are using it to drive revenue directly, become con-efficient and change the whole customer experience. In short, content marketing is being used to do more than just marketing. Before we look at what content marketing strategies actually work and the trends, it’s important for you to understand what exactly content marketing is. Content marketing is the fastest growing digital marketing strategy since the content is at the center of it all; it is what connects your brand to the customers. Content marketing is defined as a marketing approach where you create and consistently distribute valuable information that is relevant enough to attract and keep an audience with the intention of driving revenue. In content marketing, the kind of content that you share should be related to what you are selling. In short, you are informing people about your product and giving the reasons to trust and buy. The world of marketing has changed since digital marketing came into play, and now more than ever today’s consumers fully control their online experiences. The days of just throwing anything on social networks like Twitter, Facebook, LinkedIn or Instagram and calling it marketing are gone. Content needs to be relevant and address the needs of the consumer. You need to create something that they can always come back to. You need to give them a reason to believe that what you are selling is the best in the market. That is what strategic content marketing is all about. In 2019, it’s very important that you have a content marketing plan that helps you to align the content you are producing to your business goals. You need to reach that point where you create and publish content that your audience can personally identify with and still find it meaningful enough to help you achieve your own goals. This will not be easy unless you keep up with changing trends in the world of content marketing. In this digital age, the kind of content you create is either going to open the minds as well as the hearts of your consumers so that they can pay attention and actually care about your brand or not. If you can connect with your consumers in an authentic and human manner, such that it strengthens your relationship with them rather than just trying to push down your products down their throats, your results and revenue will increase in the end. Influencer marketing is not something that is new though the concept is often misunderstood by a lot of marketers and business owners. You don’t need to hire celebrities so that your brand can sell. Instead, you need to re-think your entire strategy. Think of those leaders within your industry or niche. Even within that company, your employees and customers may be what you need in brand ambassadors. Contrary to popular belief, influencer marketing isn’t about getting a well-known influencer and giving them money so that they can post about your brand on their social media channels. Instead, you might want to consider partnering with them in something called co-created content. This is where you convince them to not only share your content but to create content and post on your platform where you can promote it as evergreen content; content that lasts for years and not just a day or minutes. When hiring an influencer, building a relationship with them is very important. There is a need to think in terms of long term gains instead of a few clicks and a few posts going viral. Think about how you can build a long lasting relationship where both you and the influencer can win at the end of the day. Micro influencers can significantly change your business regardless of its size and are usually the fastest way you can build awareness about your brand and create a lasting impression with your consumers. And it all starts when you choose the right influencers, creating a good marketing plan, setting achievable goals and constantly measuring results. It will not be as easy as paying an influencer and expecting overnight success. You have to work for it. Artificial intelligence already has a significant impact on content marketing and will continue to change it in the coming years. Already a lot of AI tech exists though not easily accessible and we will only be able to see its impact on content marketing as it changes in the next couple of years. But one of the ways that AI will affect content marketing is in learning machines and analytics. AI can gather and interpret data in seconds that would take people months. How will this affect content marketing? It will whelp marketers and business owners to build content marketing strategies that are way better. As such, marketers will need to collect a lot of data about their audience and their preferences so that AI can create the type of content that the audience actually wants to engage in. This data can even allow them to personalize the data even further to create content based on things like the audience personality traits, interests, buying behavior, needs, location, and even age. If you are familiar with devices like Amazon Alexa, Google Home, and Apple’s Siri, then you know just how popular voice search is and what’s even more is that there are so many people who already use it regularly to search for content online. This is something that is bound to continue growing until people get used to it as the norm. What this means for content marketing in the future is that marketers will need to begin optimizing their content for voice search. This has not been perfected as each device tends to pull data from different sources and as such the results are different. What this means is that the marketers need to create content they know will be the one to be recommended by these voice assistants. If you are yet to start using video in your marketing efforts, then you need to start. Content marketing is changing and now more than ever consumers are no longer interested in big chunks of information. That said it’s about time you gave a try to new formats as well as mediums and changing things if they don’t work. If you have been producing long-form content, it might be about time you tested with shorter bite-sized videos like Instagram and Facebook stories. According to The 2018 State of Digital Content, these short-form videos which are less than two minutes are the most popular followed by static images. Brand storytelling is a skill that a majority of marketers lack. Most markets understand brand storytelling as talking about themselves or getting other people to talk about them. This couldn’t be further from the truth. Brand storytelling goes beyond who you are as a brand or even why you exist. It’s about that experience that you create and the way you engage with the customers as opposed to just talking about you. It’s about telling the story of where you have come from as a brand, obstacles you have encountered and how those helped you become who are you today. While social media may already be a part of us, it will still continue playing a role in your digital marketing efforts. It will continue to make an impact and get integrated both in your online and offline lives. Today most apps on your phone as you have realized are already sharing data with your social media platforms like Facebook, Instagram, Linked, Twitter and the likes. I mean, recruiters are already using social media information to screen people before conducting interviews. What does it mean then for you as a marketer? It means that you need to understand deeply each and every customer as an individual and not a group and offering your services to satisfy their needs as an individual. In the years to come, the use of chat bots will become more prevalent. According to research conducted by Spiceworks, 40 percent of big companies will use chat bots otherwise known as artificial intelligence beyond 2019. This need is created by the customers who prefer interacting and inquiring about products and services from their companies through a chat. Customers at the end of the day are interested in finding quick and simple answers to complex questions that they have which is why they prefer chatting with a chat bot. As a marketer, you can use this to create chat bots that can provide quick answers about your products and services as compared to hiring actual human beings to answer these queries. They could also collect information from customers that can be interpreted by humans to improve your marketing efforts. 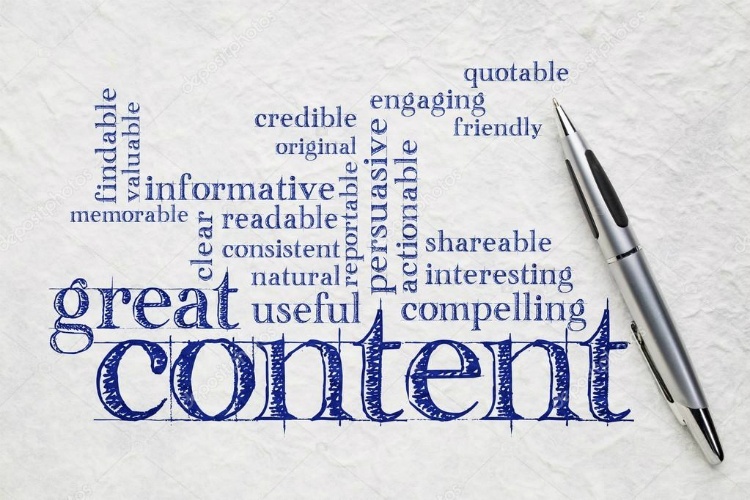 As a marketer, the concept “content is king” is not new to you. However, in a digital world dominated by blogs, webinars, white papers, and other traditional marketing strategies, as a brand, it’s very important to find a way to filter all the noise so as to reach your target audience. Research by Content Marketing Institute has it that 85 percent of existing brands depend on some form of content marketing to increase brand awareness but only 30 percent of the marketers can say that their content marketing strategies are working for them. Content is anything from articles, blog posts, white paper, press releases, infographics, webinars, videos, podcast distributed to a particular audience like Beardoholic. Content marketing is, therefore, more than a brand creating great content but using that content to achieve their goals. Content marketing is free and if done right can have a significant effect on your marketing efforts. Influencer marketing just like traditional content marketing involves generating valuable content for the target audience that can not only strengthen the brand but drive direct responses which translate into profit. When brands partner with Instagrammers, YouTubers, bloggers and the likes a brand can capitalize on that and the reach of each social media influencer. For influencer marketing to succeed, you need to build a lasting relationship with the influencer. Paid advertising on the other hand usually proves expensive to a company especially when it’s not done right. It involves paying per click so as to reach a wider audience who can buy into what you are selling as a brand. However, even when this is the case, it is more than just paying Google or social media sites so that you can appear in search results, expecting it to instantly translate into revenues. Most of the times, these efforts end up not bearing any fruit. In paid advertising, you will need to tailor your content to fit what the audience wants to see and not want you to assume they want to see. You may end up spending hundreds or thousands of dollars in advertisement and still end up without any significant returns. Create evergreen content that can still remain relevant and make people stick to your brand long after you have stopped spending money advertising. As a marketer, you know just how important content is. However, besides producing content that will generate a few clicks in minutes or trend for a few days, you need to create content that is evergreen; that your audience will always find useful. This means keeping up with emerging trends in the world of digital marketing most specifically content marketing. Zack Robbins is the founder of Beardoholic.com where he has published more than 400 articles related to men’s care and is truly trying to get the best out of every man.